View of a stone bridge over the River Dee near Corwen, in North Wales. Situated in the Vale of Edeyrnion at the foot of the Berwyn Mountains, this area is known as the Crossroads of North Wales. The River Dee flows for over 70 miles from its source in the hills above Llanuwchilyn until it opens out to its estuary near the Wirral on the North East Welsh coast. 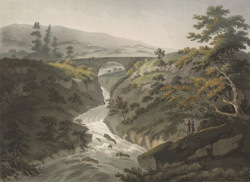 The river’s name is derived from its Celtic name - Afon Dyfrdwy.